The Enterprise Canvas is a model-type for use in enterprise-architecture, that can be used to describe any aspect of the enterprise, providing a consistent, unified view all the way from strategy to execution. But can we simplify it so as to build support for it in existing EA toolsets? The full specification for Enterprise Canvas is in my book Mapping the Enterprise, which at present you can still download for free from here; there’s also a free two-page summary-sheet in PDF format. It incorporates and unifies themes from a wide variety of other model-types in common use in EA, such as Zachman, Archimate, Business Model Canvas, VPEC-T, Viable System Model, Market Model and many others, at first glance it can often seem a fairly complex beast. So there’s a real challenge there: compress it all down into a simplified form that can be implemented on an existing EA toolset. 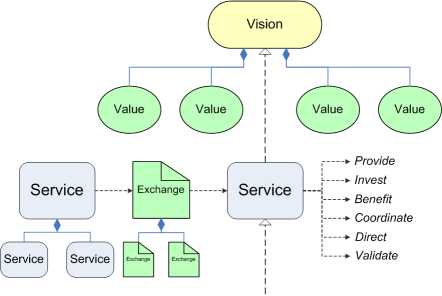 There are also two more subsidiary entity-types (Vision and Value) that are probably optional because they’re only used in one specific context and can be simulated anyway by other entity-types (Service and Exchange respectively). In Enterprise Canvas, everything is or delivers a service. One side-effect is that that means that, in a model, everything (and everyone) that does something – the service in focus, its suppliers and customers, its investors and beneficiaries, and the services that coordinate, direct and validate it – can all be represented as instances of a single entity-type, Service. Parameters for the Service entity would depend somewhat on the abstraction-layer being represented. At the next layer, row-1 ‘Scope’, Service entities can be used (if somewhat incorrectly) as placeholders and carriers for the lists of overall enterprise-content. At row-2 ‘Business Services’, Service entities should be used, but without much if any content, as the focus at this layer is on key relationships between enterprise-scope services. Toolset implementation: Start from an appropriate metamodel entity-type, such as UML or BPMN ‘Activity’, or Archimate ‘Business Service’. Rename this entity-type ‘Service’. Ensure that it has a ‘name’-parameter; other parameters are probably optional. For conceptual compatibility with BPMN (‘Activity’), Archimate (‘Business Service’ etc) and UML Activity Diagram (‘Activity’), a Service entity should be displayed as a rounded-rectangle. Exchange entities should only be used in models representing row-3 ‘Service-content’ or below. The content of the exchange should be described in terms of the ‘Asset’-column in the single-row extended-Zachman taxonomy above. Toolset implementation: Start from an appropriate metamodel entity-type, such as UML Activity ‘Object’ (‘Document’), BPMN ‘Data Object’, or Archimate ‘Business Object’. Rename this entity-type ‘Exchange’. Ensure that it has at least a ‘name’-parameter, and preferably a text-box and/or checklist to summarise the content of the exchange, as above. The Exchange entity-type could be represented in several different ways, depending on the content of the exchange, and the notation used as the base for the metamodel. A suggested default would be the ‘data object’ type used in several notations, as above. Alternatively we might use different symbols to represent different asset-types used in the respective exchange: for example, a box for physical objects, a page for information, a stick-figure for relations, and a flash for brands and other aspirational-assets. However, given that many exchanges may involve multiple asset-types or composites, it may be better to use only the default, or to allow annotation of the single entity-type, allowing one or more of the asset-type symbols as ‘decorations’, similar to the ‘decoration’ add-ons used in Archimate to distinguish between service-types. The Vision and Value entities should appear only in row-0 ‘Enterprise’, and are the only content that should appear in that row. For most purposes, only one Vision should be used: multiple Vision entities should only be used for the special case of assessing clashes between multiple shared-enterprises impacting on an organisation. (If necessary, a suitably-labelled Service entity may be used as a substitute for a Vision entity.) Use of Value entities is always optional in modelling; any number of Value entities may be attached to a Vision via composition-relations. Everything in row-1 ‘Scope’ should have a realise-relation to the Vision and, optionally, to one or more of the Value-entities (if any). Service-entities that are used to represent (‘validation-services’ (i.e. services that deliver ‘validation’ support for other other services, via a flow-relation with a ‘validate’ role), should generally take part in realise-relation chains that ultimately link up to a respective Value entity (if present). Toolset implementation: In both cases, start from an appropriate metamodel entity-type, such as the Archimate ‘Service’-lozenge or ‘Meaning’-cloud for Vision, and the Archimate ‘Value’-oval for Value. In both cases, the only parameter should be a name of descriptor for the respective vision or value. Although usage of distinct Vision and Value entities would be preferred, for clearer modelling, a simpler metamodel-implementation could use a Service entity as a substitute for the Vision entity. In this case, to keep the metamodel as simple as possible, no Value entity should be defined, and hence no specific relation-type links need be defined; instead, the single Service should used as the anchor-point for realise-relations with all layers of abstraction and concretisation (‘rows’) from below. a flow-relation may link a Service-entity to another Service-entity. a flow-relation may link a Service-entity to an Exchange-entity, or an Exchange-entity to a Service-entity. Note that flows can only link ‘horizontally’ across a row (layer of abstraction). They cannot and must not be used to link between services and/or exchanges in different rows. Toolset implementation: Start from an appropriate metamodel relation-type such as Archimate ‘flow’. The parameters should include an optional name, an identifier for the role (e.g. via dropdown-list), and an optional text-area to describe the content (if no Exchange entity is attached), triggering-events and other relevant information. 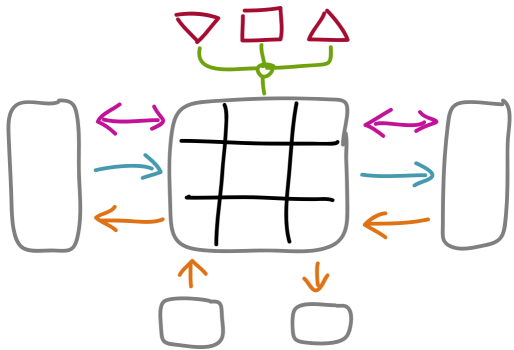 In addition to layers of abstraction (‘rows’), we often also need to model layers of granularity (composition), in which we examine in finer detail of the structure and implementation of a Service or Exchange. The nine subsidiary cells of a service within Enterprise Canvas (a matrix of inbound / self / outbound, and before / during / after the main-transaction) and the three subsidiary flows in an inter-service exchange (again, before / during / after the main-transaction) are somewhat-abstract examples of composition or decomposition. However, these are merely the standard partitionings used in Enterprise Canvas, and any appropriate alternate partitioning may be used instead. One somewhat-confusing example of composition/decomposition is the purported ‘layering’ in TOGAF or Archimate. In that context, parts of a service may be composed of (actually, implemented by) software applications, which in turn are in part composed of (actually, hosted on) physical IT systems and networks. The default meaning for a composition-relation is that the ‘child’-entity is of a structurally similar type to the ‘parent’ – i.e. a simple composition/decomposition relationship. a composition-relation may link a Service-entity to another Service-entity. a composition-relation may link an Exchange-entity to another Exchange-entity. a composition-relation may link a Value-entity to a Vision-entity. Note that composition/decomposition relationships can only link within a row (layer of abstraction). They cannot and must not be used to link between services and/or exchanges in different rows. To link between rows (i.e. different layers of abstraction), always use a realization-relation – a composition-relation should never be used for this purpose. Toolset implementation: Start from an appropriate metamodel relation-type such as Archimate ‘composition’. The parameters should include an optional name, an identifier for the sub-type (e.g. via dropdown-list), and an optional text-area to describe the composition/decomposition context. For other Archimate variations such as aggregation, assignment and used-by, it is probably best to use the respective Archimate line-decoration (open-diamond, dot and line-arrow respectively). The realization-relations should be used between all rows, as appropriate, to create a full trail of dependencies between ‘Why’ (abstract, moving ‘upward’ between rows) and ‘How’ (concrete, moving ‘downward’ between rows). There are no sub-types of realization-relation. a realization-relation may link a Service-entity to another Service-entity. a realization-relation may link an Exchange-entity to another Exchange-entity. a realization-relation may link a Service-entity ‘upward’ to a Vision-entity or Value-entity. Note that composition/decomposition relationships can only link between rows (layers of abstraction). 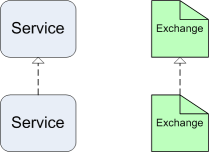 They cannot and must not be used to link between services and/or exchanges in the same row. To link within rows (i.e. the same layer of abstraction), always use a flow-relation or composition-relation – a realization-relation should never be used for this purpose. Take especial care when emulating an Archimate ‘realization’ relation. These are generally correct, in the sense that they usually link between different levels of abstraction (for example, Data Object realises Business Object); but note that in Archimate they can also be used to link between entities at the same level of abstraction. As usual, the problem here is the misleading pseudo-’layers’ (Business, Application, Technology) in Archimate, TOGAF and the like. Toolset implementation: Start from an appropriate metamodel relation-type such as Archimate ‘realization’. The parameters should include an optional name and an optional text-area to describe the realisation context. No sub-types are required for the realization-relation. This simplified version of Enterprise Canvas does incorporate all of the original features, but in somewhat different form: a significant amount of the information – particularly around relative roles of services – is now carried within the entities and flows, rather than as per the original entity-notation. There are also some potential inconsistencies in the way relations are mapped in the ‘Scope’ layer (row-1). In some ways this version is simpler to use, but a side-effect is that more responsibility for correct modelling of underlying detail is passed to the modeller rather than explicit in the notation. By default, colours for entities and flows are not semantically significant. Use colour in any way which suits the meaning best. One crucial area of concern is around inter-layer (inter-row) relationships – i.e. via realization-relations. 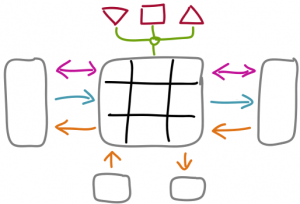 In common with UML and BPMN, Enterprise Canvas demands a rigorous approach to proper modelling of links between versus within the respective layers of abstraction. However, anyone whose main architecture-modelling background is via Archimate, TOGAF or the like may not be fully aware either of that rigour, or of the need for it in practice. The problem is that because of the explicit IT-orientation and implicit IT-centrism of those frameworks, separation of layers of abstraction is blurred together with pseudo-’layers’ of implementation-category, as described above: ‘Business’ for purpose and human focus, ‘Application’ for (IT-specific) information, and ‘Technology’ for (IT-specific) physical hardware. In effect, the ‘Business’ pseudo-layer includes both purpose/human implementation (row-4 and below) and most items in implementation-independent layers of abstraction (row-3 or above). This cavalier approach to layers of abstraction is a major cause of problems when trying to use Archimate and the like in any non-IT-centric context. In short: use flow and composition-relations only within layers of abstraction (rows); use realization-relations only between rows. Don’t mix them up!